For more information about this Proven Safety Countermeasure, visit the Office of Safety's Rumble Strips and Rumble Stripes website. Source: NCHRP Report 641, Guidance for the Design and Application of Shoulder and Centerline Rumble Strips. Longitudinal rumble strips are milled or raised elements on the pavement intended to alert drivers through vibration and sound that their vehicles have left the travel lane. They can be installed on the shoulder, edge line of the travel lane, or at or near center line of an undivided roadway. 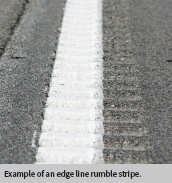 Rumble stripes are edge line or center line rumble strips where the pavement marking is placed over the rumble strip, which can result in an increased visibility of the pavement marking during wet, nighttime conditions. With roadway departure crashes accounting for more than half of the fatal roadway crashes annually in the United States, rumble strips and stripes are designed to address these crashes caused by distracted, drowsy, or otherwise inattentive drivers who drift from their lane. They are most effective when deployed in a systemic application since driver error may occur on all roads. Transportation agencies should consider milled center line rumble strips (including in passing zone areas) and milled edge line or shoulder rumble strips with bicycle gaps for systemic safety projects, location-specific corridor safety improvements, as well as reconstruction or resurfacing projects.